Hey, friends. I've got a fun and simple DIY candle making project for you today. It's one of my favorite projects ever and I don't know why I waited so long to try it. 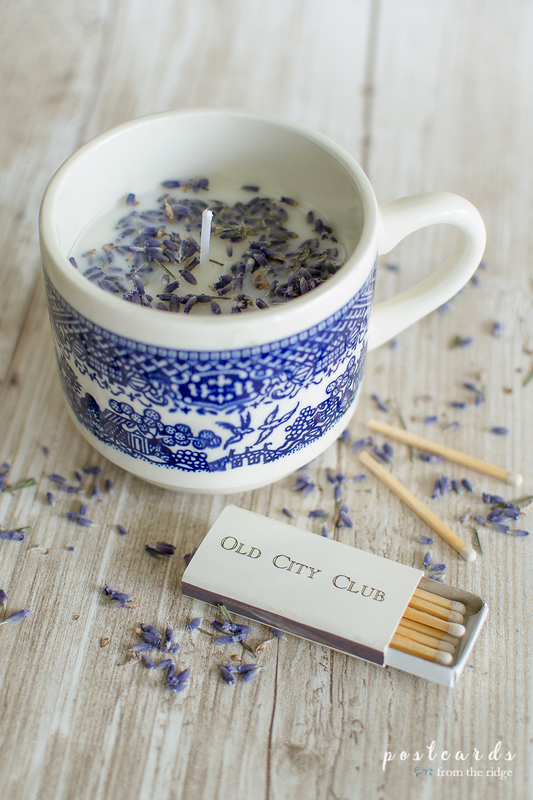 It incorporates 3 things that are very important to me - vintage/recycled items, environmentally friendly items, and candles. And lavender too, but you can use any scent with these. 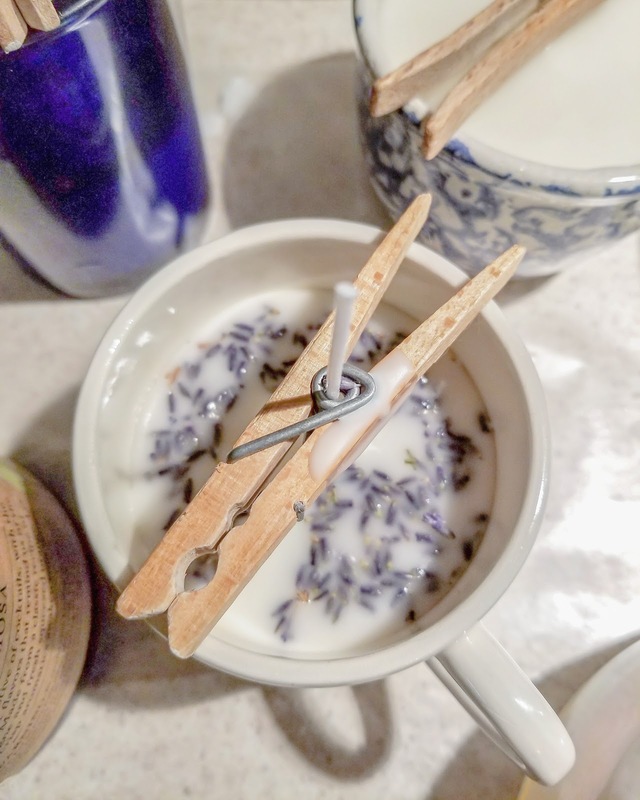 My oldest daughter and I made these lavender candles along with several others a few weeks ago and I'm just now getting around the sharing how we did it. For years I've wanted to make candles and just never took the time to do it. Plus I admit that I was a little bit intimidated. But not any more. We spent a few hours bonding over cleaning out old containers, melting soy wax, pouring the wax and fragrance, and then enjoying the fruits of our labor! I'll be doing again with my youngest daughter soon. When I posted a photo on instagram and facebook several of you asked how we did it so here's the tutorial. 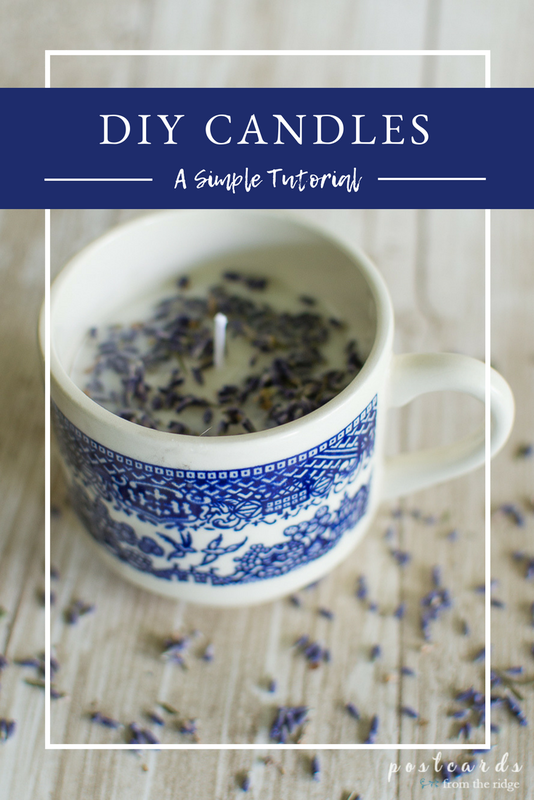 For our candles, I used some of my stash of old candle containers (I knew that I would eventually do something with them) as well as some cute vintage blue and white teacups. For reusing the old containers, I placed them in the freezer for a day or two and then scraped out the old wax and removed what was left of the wick. I cleaned them as well as possible. You can find new, inexpensive containers HERE. There are some tea cups similar to mine HERE. Or you can even make candle containers from bottles using THIS TOOL. You can also use cleaned out jars, cans, tins, or whatever you like. The sky is the limit. Q. How much wax do I need? A. Typically, one pound of candle wax = 20 oz of melted wax. So, for example, if you want to make a mason jar candle, see how many ounces it holds and that's how much wax you'll need for that candle. Add up the total oz needed to fill all of your containers and then divide by 20. That will tell you how many total lbs of wax you need to melt for your candles. 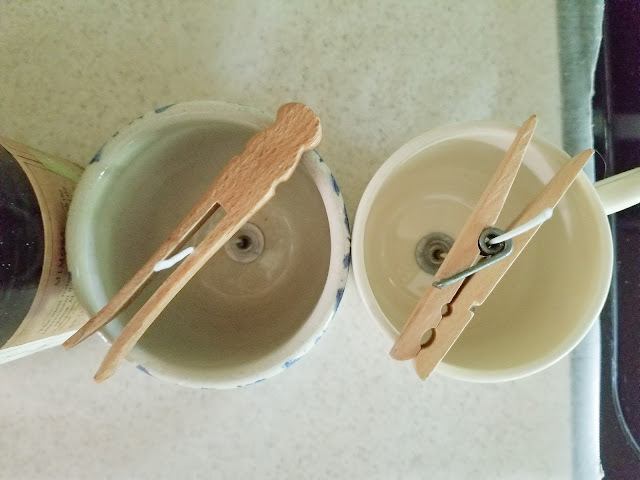 Add your soy wax to a candle pourer. Place the pourer inside of a large pot filled with a few inches of water. Bring the water to a boil. After the wax melts, allow it to cool. There are several wick sizes. Who knew? I sure didn't. Be sure to check the opening size of your container and get the right size. (Use these for 3" diameter soy candles). Stick the wicks to the bottom of your container with hot glue or these wick stickers. We used the wick stickers because they're heat resistant. I didn't want the hot wax to cause the wicks to come unstuck. TIP - Slide a straw over the wick to help keep it straight and stable while you're sticking it to the container. Or put the sticker in the container and then stick the wick to it. Otherwise it's tricky to get it centered. Those darn tricky wick stickers! After the wax has cooled to 130° or 140°, add your fragrance. 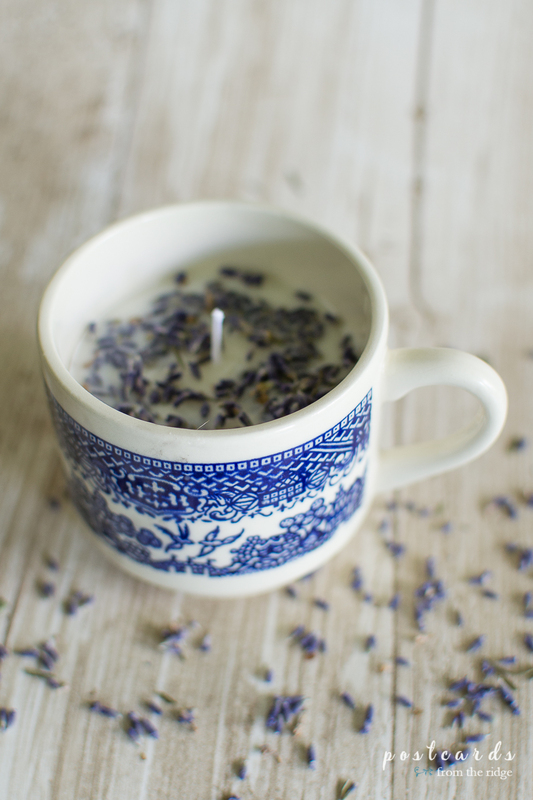 You can use essential oil or candle fragrance. For candle fragrance, typically one oz of fragrance is needed for each pound of wax. For essential oil, you'll want to add around a half an ounce per lb of wax. TIP - to make cleanup easier, place wax paper on the surface underneath your containers before you begin pouring the wax. Fill your containers with the liquid wax, leaving a little wax in your pourer. Allow the wax to harden and fill in any sinkholes that occur with the leftover wax. This gives them a nice finished look. If you want to add anything like lavender buds or dried rosebuds, add them while the wax is still wet and they'll stay in place better. NOTE: don't ever pour melted wax down the drain. It will harden after it cools and can block your pipes. Finally, trim the wicks and enjoy your candles! For cleanup, try to wipe off excess wax with a paper towel while it's still wet. And you'll probably want to have tools that are dedicated to candle making since you'll never get all the wax off. Just another good reason to make more candles! Let me know if you decide to make candles and how they turn out. I'd love to see photos of them too. I can almost smell these through my computer screen! They are so pretty and I can only imagine how great the lavender smells. When my daughter was in high school, she and I made a few candles but mostly she did. Amy made them as gifts for her teachers and friends one year and they turned out great! Pretty much the same way you've shown here ~ great tutorial! Plus I LOVE the lavender idea!!! I also really love lavender! Have you burned any of these candles yet? How do the lavender buds do? Do they just sink to the bottom or do they burn or something?